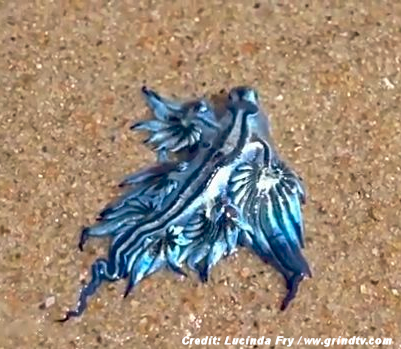 IT looks like something from another world but this “blue dragon” that washed up on Broadbeach this week is actually a sea slug. The glaucus atlanticus was captured on video by Lucinda Fry on Thursday morning, after it was washed into shore following its favourite food, blue bottles. The bright blue slugs, or ­nudibranch, can pack a sting according to Griffith Univers-ity marine invertebrates expert Kylie Pitt. “I have handled them before and wasn’t stung, but I would not recommend anyone pick them up because they can have a painful sting,” Professor Pitt said. She said the nudibranch – a soft-bodied marine creature that sheds its shell after larval stage – eats the marine stingers blown on to Gold Coast beaches by easterly winds at this time of year. “They are really weird,” she said. Looks like something the late Jack kirby would draw!